The message of the Holy Father for the 42nd World Communications Day is entitled "The Media: At the Crossroads between Self-Promotion and Service. Searching for the Truth in order to Share it with Others." The message was issued on 24 January, the feast of St Francis of Sales (patron saint of journalists). World Communications Day itself is on 4 May. For those of us who write blogs, this offers an opportunity for an examination of conscience. I found it helpful to read this address as it applies to the Catholic blogosphere. We are part of the world of social communications and the Holy Father is speaking to us as well as to the mainstream media. We should take careful note of what he says and try to put into practice his wise advice. I am sure many of us would agree that we have a "special responsibility for promoting respect for the family, making clear its expectations and rights, and presenting all its beauty". The family is at the very heart of the spiritual battle and we can always do more to support our good Catholic families. Pope Benedict says that the media should not be used for "self promotion" but should always be "at the service of the person and the common good." Nobody is going to admit that their blog is used for "self promotion" but pride is always a temptation and we need to be consciously aware of it. There is no harm in promoting a good blog but it should be in the service of the truth, not of "me, me, me." It is clear, for example, that in certain situations the media are used not for the proper purpose of disseminating information, but to "create" events. This dangerous change in function has been noted with concern by many Church leaders. Precisely because we are dealing with realities that have a profound effect on all those dimensions of human life (moral, intellectual, religious, relational, affective, cultural) in which the good of the person is at stake, we must stress that not everything that is technically possible is also ethically permissible. I have occasionally spoken in jest of releasing "the power of the blog". Clearly this can be ethically permissible in the service of the common good but we also need to consider that this power must only be used for the common good and not for power for its own sake. Against moral relativism, the Holy Father says that "seeking and presenting the truth about humanity constitutes the highest vocation of social communication." Although most Catholic bloggers are not moral relativists, it is good to be reminded about the highest vocation of one who is involved in social communications. 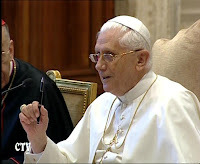 The Holy Father underlines the importance of the new media and the internet in this regard. Let us ask the Holy Spirit to raise up courageous communicators and authentic witnesses to the truth, faithful to Christ’s mandate and enthusiastic for the message of the faith, communicators who will "interpret modern cultural needs, committing themselves to approaching the communications age not as a time of alienation and confusion, but as a valuable time for the quest for the truth and for developing communion between persons and peoples" (John Paul II, Address to the Conference for those working in Communications and Culture, 9 November 2002). Perhaps readers might say the prayer to the Holy Spirit for this intention, praying for all Catholic bloggers especially, that they might be courageous communicators and authentic witnesses to the truth. BTW. On World Communications Day, you will probably be invited to contribute to a collection for the Catholic Communications Network. For more information on the CCN, in the context of the Supreme Pontiff's message for World Communications Day, see Damien Thompson.